Dungannon Swifts take on Linfield in their final-four clash tonight. 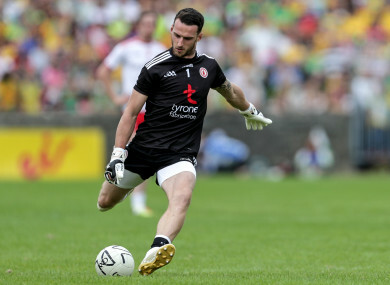 Tyrone goalkeeper Niall Morgan (file pic). TYRONE GOALKEEPER NIALL Morgan will line out for Dungannon Swifts in a League Cup semi-final tonight after getting permission from manager Mickey Harte. Morgan, who has recently played for Dungannon, has been drafted into the starting line-up for the clash with Linfield at Stangmore Park due to a goalkeeper crisis in the Swifts. The42 understands however, that he will be back with the Tyrone footballers for their opening Dr McKenna Cup game next week. Dungannon’s first-choice shot stopper Alex Moore — who is on loan from the Blues — is ineligible to face his parent club, while their back-up keeper Stuart Addis is injured. Morgan will therefore be stepping in for the Swifts, having already played five games for the Dungannon outfit since the end of October before he subsequently resumed his Gaelic football commitments in December. Niall will play – it’s a one-off and we are grateful to Mickey Harte and Tyrone for releasing him for this game,” Dungannon boss Kris Lindsay is quoted by the Belfast Telegraph as saying. Twenty-seven-year-old Morgan previously played for Dungannon between 2011 and 2013 before leaving to focus on playing for the Tyrone footballers. “He has obviously played in a few games this season and Mickey has thankfully allowed him to play on Tuesday night,” Lindsay added. Tyrone will take on Derry at Celtic Park in the opening round of their Dr McKenna Cup campaign on Thursday 20 December. Email “Tyrone GAA keeper to line out in Irish League Cup semi-final against Linfield”. Feedback on “Tyrone GAA keeper to line out in Irish League Cup semi-final against Linfield”.